Manchester United has reported a small reduction in the club's debt burden at the end of last year. The football club said its gross debt was £507.5m in the three months at the end of 2009, compared with £538.1m in the same period the year before. Pre-tax profits for the quarter were £6.9m compared with a loss of £2.7m in the same period in 2008. 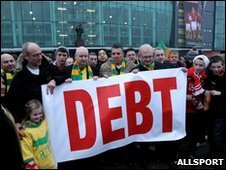 But the club's parent company, the Glazer-controlled Red Football, said in January that overall debt was £716.5m. In addition to the club's half-billion pound debts outlined in the latest accounts, Red Football is still saddled with more than £200m of high-interest loans from three US hedge funds charging an interest rate of 14.25% per annum. The Business of Sport - Football in the Red. The news comes as the "Red Knights" consortium of financiers has been meeting to discuss a possible bid. The "Red Knights" group consists of Goldman Sachs economist Jim O'Neill, lawyer Mark Rawlinson and financier Keith Harris. US sports tycoon Malcolm Glazer took over the club for £800m in 2005. But his reign has been controversial, with many fans opposed to the huge levels of debt that Red Football, the club's holding firm, took on to finance the takeover. By June last year, the club's debt passed £700m for the first time. Many fans wore green and gold - the colours of Newton Heath before it was renamed Manchester United in 1902 - at Sunday's Carling Cup final, which the defending champions won. In January, Manchester United successfully raised £504m through a bond issue, meaning the Premier League club will be able to pay off nearly all their outstanding debts. The club faces an annual interest bill of £45m a year on the bonds. Revenue in the last three months of 2009 rose to £87m, from £74.4m in 2008. Manchester United's cash balance stands at £122.1m, up from £8.6m. There was increased income generated from matchday revenues and its TV rights, particularly from the elite Champions League competition. Media revenues rose 33% to £53.4m.